Good evening, I hope everyone had a happy and productive Monday. This coming weekend is the first in which I will be running two races. Saturday, I will be running in TriRock New York at Harriman State Park, and Sunday I will be competing in the first leg of the United Health Care Triple Crown Race Series. Friday afternoon I will be heading into the city to pick up my race packet for TriRock, and I must say I am so excited for this race this year. This will be my first tri of the season, and I can’t wait to show off the new speed in the run leg of the race. 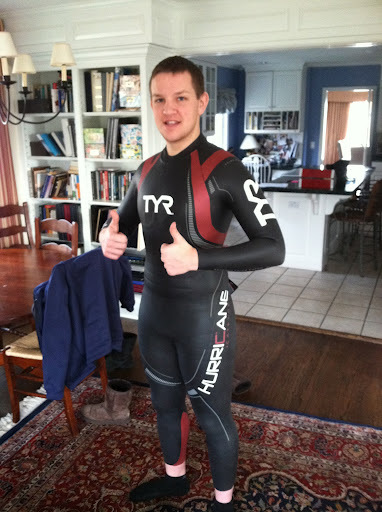 This will also be my first opportunity to get in the water in my new TYR Hurricane CAT 5 wetsuit! I am not sure exactly what I expect my finishing time will be, but I do plan to have a competitive time and hope to finish top five in my age group. After TriRock, I will head right up to Rhode Island to the race expo for the Providence Race. I have a time I am shooting for, but do not want to let that information out of the bag just yet. I do not know how I will feel after the triathlon Saturday, and do not want to be disappointed if I am unable to hit my time goal after I posted it here. As far as I am concerned, the Triathlon on Saturday is my top priority of the weekend and the half marathon is secondary. I am very excited to be getting back into the heart of race season! It truly is the best part of the year! Also, I am a huge New York Ranger fan who are in the middle of their playoff run! Let’s Go Rangers!! !